A volcano is a place on the Earth from which magma and gases associated with magma flow through the Earth's crust onto the surface, whether on land, in shallow waters along the shoreline, or under the sea. Scientists estimate that there are tens of thousands of active and dormant volcanoes on Earth, and thousands more extinct volcanoes. Water and volcanoes are closely linked. Water plays significant roles throughout the "life cycle" of magma: from its production deep within the Earth, to its fiery escape at a volcano, to its final cooling. The making of a volcano requires magma, and the making of magma requires heat. In other words, rock that is deep within the Earth must melt before a volcano can form. Most of the Earth's interior, although hot, is solid. From experiments it is known that water decreases the melting point of rock. If water is introduced to regions deep within the Earth, then solid rock there may begin to melt. Water is introduced into the deep Earth when oceanic plates descend beneath continental plates , a process called subduction . Oceanic plates, such as the Juan de Fuca plate off the Oregon and Washington coasts, have thick, water-laden sediments at their surface. When these plates subduct, some of the sediments are dragged deep beneath the continents. As a plate descends, the pressures and temperatures it experiences increase, and the water-laden sediments are baked (metamorphosed) and squeezed into new types of rock. At about 100 kilometers (62 miles) in depth, these metamorphosed sediments are transformed yet again, and during this second metamorphism, water is released from the newly formed metamorphic rock. The released water immediately vaporizes at these temperatures and pressures, and the vapor rises. As the vapor moves upward, it enters hotter rocks, since the deeper rocks have not had time to warm up to the surrounding temperatures and have cooled somewhat due to energy being removed as rising water vapor. These shallower rocks are so hot (1,300°C or 2,372°F) that they are near their melting points. The presence of the water in its vapor phase causes the melting point to decrease and the rock to melt and absorb the vapor. Thus, 100 kilometers (62 miles) beneath the western parts of Oregon and Washington, magma is forming. The magma that is produced is less dense than the rock from which it melted. Therefore, once formed, the buoyant magma, full of dissolved water vapor and other gases, will slowly force its way toward the surface. As the magma rises, the pressure from the overlying rock is lessened and the magma loses its ability to hold dissolved water. Bubbles of water vapor and other gases, mainly carbon dioxide, start to form. Hawaii's Puu Oo, the easternmost of Kilauea's craters, spews molten lava in a non-explosive eruption in 1985. Episodic lava fountains in the mid-1980s built a massive cone which partially collapsed in the late 1990s. pressure on its contents is released, causing gases to come out of solution and froth towards the surface. In the same way, when magma moves towards the surface, water vapor and carbon dioxide come out of solution and form bubbles. The rate at which these bubbles form and rise to the surface is a function of the water content of the magma and its viscosity. Viscosity can be described as a resistance to flow; for example, honey is more viscous than water because it flows more slowly than water. Viscosity in magma depends on two things: temperature and silica content. The higher the temperature of the magma, the lower the viscosity. The higher the amount of silica (which is present in all magmas), the higher the viscosity due to the ability of the silica to form chains (polymers) that link together and hinder the movement of the magma. Variations in water content, temperature, and viscosity lead to markedly different eruptive types of volcanoes. 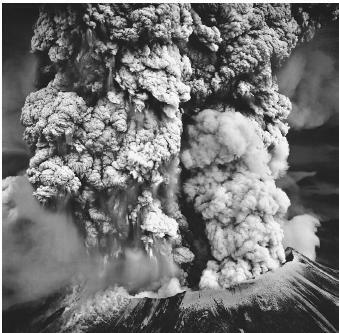 Volcanologists usually define two categories of eruption: non-explosive and explosive. Examples of non-explosive eruptions can be seen on the island of Hawaii. The volcanoes on the Big Island spew lava of low silica content, called basalt. As this low-viscosity magma rises within a volcano to near the surface, water vapor in the form of gas bubbles will quickly come out of solution and cause a brief fountaining effect where bits of lava are spattered around the vent, causing a "spatter cone." The explosive eruption of Mount Saint Helens in the Cascades Range of western Washington blew off 375 meters (1,235 feet) of the mountaintop and rained ash as far as 800 kilometers (500 miles) to the east. The energy released by the May 18, 1980 eruption was equivalent to the explosion of 500 atomic bombs of the type dropped on Hiroshima, Japan during World War II. When most of the water vapor has come out of solution, the eruption becomes less dramatic and the lava flows rapidly downslope. As the basaltic lava cools and the viscosity increases on its path away from the vent, the remaining water vapor bubbles find it increasingly difficult to rise to the surface of the lava flow. These last bubbles become trapped when the lava becomes solid and their shape is preserved as "vesicles" in the rock. In magmas with a high dissolved gas content, the rapid decompression associated with a quickly rising magma body can cause the gases to expand in a violent upthrust of a dense mixture of hot gas, lava, and rocks. (This phenomenon was seen at the eruption of Washington state's Mount Saint Helens on May 18, 1980.) The mixture of gas and rocks rises quickly in the cool air, forming an eruption column that can rise up to 45 kilometers (28 miles) in height. Sometimes, eruption columns can collapse, producing a pyroclastic flow. Pyroclastic flows have proven to be one of the deadliest features of highly explosive eruptions due to the high speed at which they travel, riding on a cushion of air trapped below the collapsing column. They can engulf surrounding villages in hot, poisonous gases, rock, and ash. Water Circulation in Inactive Volcanoes. When a volcano's eruption ceases, the magma within the underground chamber will remain hot for hundreds or thousands of years. Circulating groundwater that comes into contact with the cooling magma is heated and rises to the surface along rock fractures to form either a thermal spring, fumarole, or geyser. Heated water from some thermal springs—for example, in Iceland, Italy, and New Zealand—are used to heat homes and businesses. Sometimes deeply circulating hot groundwater dissolves minerals from the cooling magma. The dissolved minerals are then precipitated from the hydrothermal solution and deposited in the openings of the surrounding rock, usually filling cracks and sometimes replacing the rock itself. These deposits tend not to have great vertical extent but are exceedingly mineralrich. Many famous silver and gold deposits of the western United States, such as Comstock, Nevada and Cripple Creek, Colorado are examples of hydrothermal ore deposits. SEE ALSO Earth's Interior, Water in the ; Geothermal Energy ; Hot Springs and Geysers ; Hot Springs on the Ocean Floor ; Mineral Resources from Fresh Water ; Plate Tectonics ; Volcanoes, Submarine. Philpotts, Anthony R. Principles of Igneous and Metamorphic Petrology. Upper Saddle River, NJ: Prentice Hall, 1990. Fluid inclusions are tiny quantities of liquid, gas, or mixtures of the two, trapped within minerals. Their sizes range from 0.01 to 0.1 millimeters (0.0004 to 0.004 inches) in diameter. Inclusions may be observed within a given sample by cutting the mineral into very thin slices (30 to 35 microns [about 0.001 inch]) with a diamond saw and viewing the slice under a transmitted light microscope. Fluid inclusions carry information about the history of the surrounding rock material from which they formed. They are considered to be direct samples of the volatile phases that circulated through the lithosphere (the Earth's crust and uppermost mantle) during the course of Earth's history. 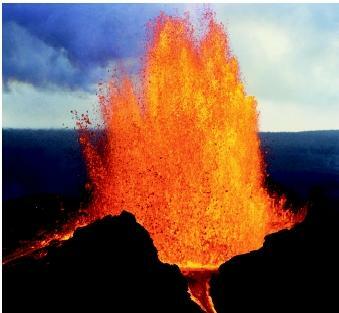 Erupting volcanoes near or under the ocean may produce towering steam eruptions when the superhot lava contacts the cool water. Volcanoes under ice caps may exhibit an even more spectacular behavior. Basalt lava is capable of melting about ten times its own volume of ice. So when ice-covered volcanoes erupt, huge volumes of meltwater can accumulate until the glacier bursts. The ultimate result, known in Iceland as a jökulhlaup, is a powerful flood of water, ice, mud, and rock. These destructive torrents can achieve discharges comparable to that of the Amazon River. The most recent jökulhlaup in Iceland occurred in 1996. Pyro-Not really and its not inercrcot either. As published and mostly accepted when magma gets to within 3-5 kms from the surface as a boiling mass of gases and liquid rock it starts to release that vertically. Gases break the rock, the magma exploits them and because of the lowering of the pressure it starts expanding into higher volume and really starts the process going. Higher pressure from rock, ice, ocean or a combination of all of them would serve to keep that gas from expanding. But also as widely accepted is the 3-5 km magma buoyancy equilibrium. Remove the ice, or the ocean or even allow a vent tube to come up 100 meters and it can tip the scales. There is so little that is known about the earth and its processes that we likely will never get a handle on it with only the general stuff being accepted. We have seen groups like the IPCC use information, without verification and accept it because it came from some previously held in high regard scholars. Now branded charlatans we are rethinking things. Its the open mind that accepts theories and then works to disprove them. By elimination they came up with the magma equilibrium theory and it may or may not be right. It would be acceptable to assume just one thing about Katla ..The general idea and that is when the pressures below exceed those above it will erupt. I think we can all agree on that. Everything else is conjecture and I can laugh about it and say What do they do if the ice turns to water and runs off and there is no eruption? Or if it does? I dont think if it does that anyone is going to give a care about that until years after a Katla eruption is well over. And then the new theories will abound.